If you need one of these little quarter-circle curves, here are some new options. 2X4X1 1/3 bows (Design ID 6081) come in Bright Orange [TLG]/Orange [BL] (Element ID 6075359) and Medium Azure (6071245), and the simpler 1X4X1 1/3 in Earth Green [TLG]/Dark Green [BL] (Element ID 6062010 | Design ID 10314) which, as I mentioned in my Mini Cooper review, also comes in a second version with a printed double white line - the first time this part has been printed. 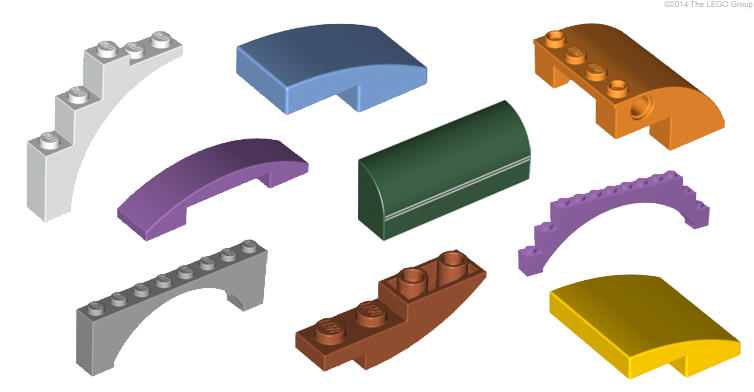 Thanks in no small part to the Mixels, the 1X2X2/3 'baby' bow (Design ID 11477) continues to propagate in a multitude of hues! Br.Yel-Green [TLG]/Lime [BL] (Element ID 6069006), Earth Green (6055225), Medium Azure (6071246), M.Lilac [TLG]/Dark Purple [TLG] (6057390) and Reddish Brown (6069984) are all welcome additions as is the newly released Medium Blue (6092039) which currently only comes in LEGO FUSION Create and Race 21206 . That is the new virtual/digital theme, solely available in the US at the moment. You may not have noticed the difference but joining the previously released Silver Metallic [TLG]/Flat Silver [BL] baby bow is one in Silver Ink [TLG]/Metallic Silver [BL] (Element ID 6066028 | Design ID 17134). The new Shell/Ferrari promotion, which is in very limited availability at present, includes a Ferrari 512 S which uses the 2X2X2/3 bow (Design ID 15068) in Bright Yellow [TLG]/Yellow [BL] (Element ID 6079007) but I imagine this will appear in themes like City soon enough. This part has also arrived in Orange (6067913) and in Silver Metallic (6083508), as discussed by Scott in his recent Agents review of Infearno Interception. The 'telephone' 1X4X2/3 bow has been somewhat sidelined by the baby bow, but clearly still has a place in LEGO sets - Friends 41036 Jungle Bridge Rescue introduces it in Medium Lavender (Element ID 6070777 | Design ID 93273). It's very nice to see the recently-introduced 1X4X1 inverted bow has another new colour: Dark Orange (Element ID 6065039 | Design ID 13547). This comes in a couple of Chima sets including the Sabre-Tooth Walker which Jeremy reviewed recently. Moving on to the family of four-long bows, Scott also mentioned the 1X4X1 as being available in Silver Metallic (Element ID 6078607 | Design ID 11153) whilst Jeremy got the 2X4X1 in Dark Orange (Element ID 6071236 | Design ID 93606). That part also comes in Yellow now (Element ID 6079001), but again only in the Ferrari 512 S at present. Finally, this larger family of bows offers some new Orange versions thanks to the Arctic theme: the 4X4X2 (Element ID 6070111 | Design ID 61487) and the 2X8X2 (Element ID 6070105 | Design ID 11290). For a moment I'm going to ignore my criteria of only discussing summer releases because the latter also comes in my beloved Medium Stone Grey [TLG]/Light Bluish Gray [BL] (Element ID 6070266), as does the inverted 2X8X2 (Element ID 6070267 | Design ID 11301)... I'm sure Spacers will find use for these. They were released in April in 79121 Turtle Sub Undersea Chase . As discussed in a post back in March, arches have gone through some slight but noticeable changes in recent times and with the release of the summer wave of sets we have some new colours of arches to use; mostly those very useful neutral tones. The curve of the 1X5X4 half-arch has recently been restored to being a original perfect quarter-circle (Design ID 14395) and now comes in White (Element ID 6056259), Tan (6075057), Dark Bluish Gray (6075060) and Black (6075062). It was available in all these colours in the 2000s (as Design ID 2339) before they mucked up the curve, but now you won't need to pay so much to get hold of them. The most recent arch to be altered, the 1X8X2 arch with raised curve (Design ID 16577), is now available in White (Element ID 6062279) and Light Bluish Gray (6079722) as well as Dark Orange (6079725). Bucking the neutral trend is the 1X12X3 arch with raised curve, now in Medium Lavender (Element ID 6096380 | Design ID 18838). 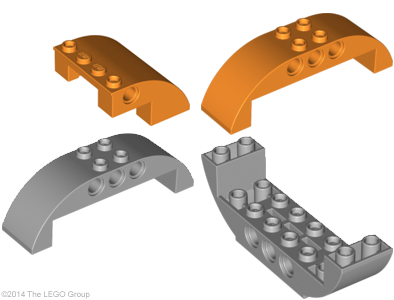 I've gotten an interest in tertiary colors, and it seems that Lego never has released any elements in reddish orange? (For an RYB system, The prmary colors are red, yellow and blue, and the secondary green, orange and purple.) Turquoise (teal) and violet have been produced but are currently phased out, but there might be sufficiently similar options. Thank you. So all of these are official releases? No prototypes?